The 63rd women’s Knock-Out final was contested by the two most successful clubs in the competition. Hibernians came out tops to notch their 17th KO triumph in history, three years from their last triumph in 2016 and also secure their third honour this season after earlier successes in the Super Cup and the Louis Borg Cup. Caffe Moak Luxol were searching for a threepeat after winning the KO in the last two seasons but had to succumb to the Paolites to remain as the second successful team in the KO history with ten wins. Hibs got off to a good start with a Samantha Brincat trey and five points, off an and-one and a hoop, from Sophie Abela. But Luxol hit back strongly to jump to a 10-8 lead in the next two minutes following an 8-0 streak with a Monique Caruana three-pointer and a three-point play by Sarah Pace after a foul by Leanne Duncan who was delighted with the win. 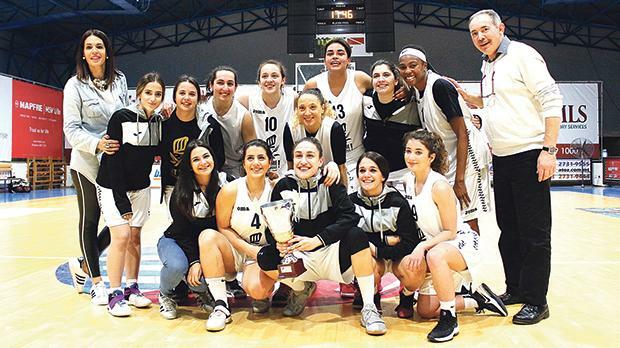 “We knew that it was not going to be an easy game but with the whole team on the same page and with the right energy on and off court we managed to grab our third seasonal cup which is a boost for the playoff games,” Duncan told the Times of Malta. Hibs had to call an early timeout which worked out perfectly well for them as they came back with 11 consecutive points with their top scoring American import Amelia Simmons grabbing the first of her 20 game points. In fact, Simmons has been a regular reference point, together with Brincat, for her team-mates. “This was a very competitive final and the intensity and physicality on the court felt like a playoff game,” Simmons said. “We did struggle a bit in the beginning of the match with careless turnovers but we managed to stay together and pick each other up. “My team-mates have really been amazing all season by stepping up in the big moments. So this win is a great momentum going into the finals of the league. Hibs player Hannah Al Tumi wins the ball ahead of Monique Caruana, of Luxol. The second quarter was a low-scoring affair with Luxol managing to reduce the deficit momentarily to seven points, 19-26 after a Sharon Vella basket. But late hoops from Iona Agius and Hannah Al Tumi helped Hibs, who were putting loads of defensive pressure on Luxol’s dangerous player Alexis Dillard, to a half-time double digit lead, 33-21. Sophie Abela, fresh from winning the February player of the month award, notched her seven game points in the first half and said: “Winning the Knock Out was not a walk in the park especially after also prevailing in a very hard-fought game against Starlites in the semis. “We knew facing Luxol would not be easy and the game started off slow but we stayed well in it mentally and physically. For the first part of the third quarter, Hibs managed to maintain the margin for 37-27 midway in the session. Here, Luxol produced a positive moment as Dillard found breathing space to pot in some hoops assisted also by guard Kayleigh Portelli. The game reopened momentarily as Luxol made it a four-point game, 39-43, with 11 minutes to go. Dillard, who then had to leave the game with five personal fouls midway in the last quarter, said: “It was a very good match up with both teams playing with a lot of intensity and aggression. Both teams had a rough start just to find the rhythm due to each team’s intense defence. “Even though we trailed most of the time, we never let our heads hang low especially when questionable fouls were called and we remained fighting until the very end even after I was fouled out. In the last minute of the third quarter Hibs managed to regain a double-digit advantage as Emma Micallef had six personal points including a trey and free throws after a Pace unsportsmanlike foul. The Paolites managed to withstand Luxol’s efforts at the start of the final quarter and even slightly extended their lead to 57-44. Despite losing Dillard on fouls, Luxol tried a last-ditch effort with Pace grabbing seven late points but Simmons, with late shots from the charity line, ascertained Hibs’ victory. At the end of the match, MBA president Paul Sultana presented Hibs captain Elena Cassar with the winning trophy after the match. After this triumph, the Hibs’ clan now will surely look eagerly at the league final series where they await, given they ended the regular season at the top of the standings, the winners of the semi final series between Luxol and Starlites. Dillard is hopeful about Luxol’s chances. “We are now looking forward to the semi-final series and we plan to keep the same energy and intensity for the games against Starlites,” Dillard said. On her part Abela is feeling confident. “The upcoming league finals will certainly not be easy but we have a good amount of time to prepare ourselves and be ready to face any upcoming opponent,” Abela said. Hibs: E. Micallef 8, E. Cassar 3, K. Calleja, S. Brincat 10, I. Agius 4, J. Abela, S. Abela 7, A. Simmons 20, N. Farrugia, H. Al Tumi 10, K. Caruana, L. Duncan 4. Luxol: S. Pace 15, L. Caruana Montaldo, Ni. Vella, I. Baena 2, No. Vella, S. Vella 6, K. Portelli 8, A. Borg, P. Ellul 3, M. Caruana 3, C. Mifsud 2, A. Dillard 14.